Pension Rewards aims to reduce the global unemployment by creating a decentralized talent hub to allow individuals to share and trade skills anywhere, anytime and any day. Based on the Proof of Skill and Proof of Freelance algorithms, the platform will utilize smart contracts to create a more transparent and trustless environment for both clients and freelancers, companies and employers. 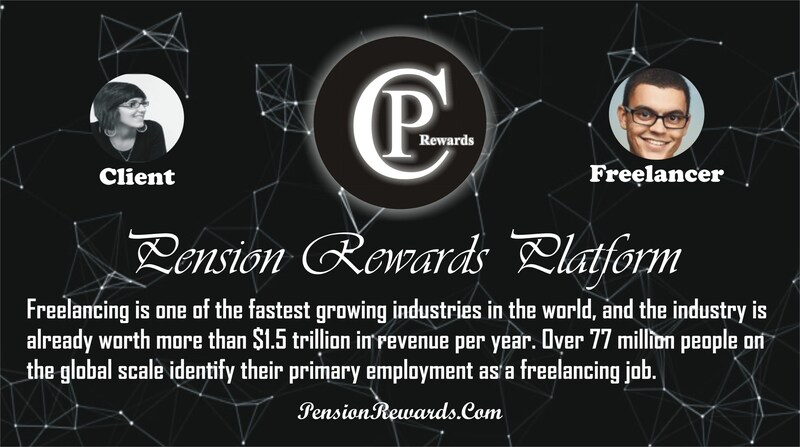 Pension Rewards will issue a utility crypto-token [$PCoin] with multiple use applications – participants of the platform will be able to utilize it to pay freelancers or trade it on various cryptocurrency exchanges for other crypto or even fiat. The platform will fully utilize the capabilities of Blockchain where you could earn money by completing various tasks using $Pcoin as base payment currency and by this will make the demand of their token affect its value upward since there is a market for it. The technology simplifies the process of decentralizing job opportunities, embracing skills, disrupting unemployment while they aim to empower the world’s freelance/workers/gurus/youths community by creating one of the largest worker-centric decentralized ecosystem where independent workers can pursue their passions and get the value they deserve from the gig economy. Summary: Pension Rewards is a blockchain powered ecosystem that connects clients and freelancers with the use of cryptocurrencies. The future of work. Freelancing is a skill that has seen notable strides ever since the internet became widely popular. With the ability to communicate and work with a wide array of people all around the world without physically having to share a common space, one opens a world of possibilities for themselves. More exciting things in their whitepaper. They are building a platform that will solve a real world problem by tokenizing their platform to expand the wide adoption of cryptocurrencies. This I believe is what every project out there should do as well in order to fasten the adoption of the tech. Their ICO Stage 1 Is Live Now. To Know More About This Wonderful Project, Connect with their official links below.